Colts GM Chris Ballard reportedly “really likes” the former Miami basketball player turned tight end who could carve out a bigger role for himself after the departure of Dwayne Allen. Colts tight end Erik Swoope played the most snaps in Week 6 when he got on the field for 40 plays after Dwayne Allen’s injury. The Colts threw the second most touchdowns to tight ends in the league with 12, behind only the Los Angeles Chargers (15). Only five teams threw to their tight ends more than Indianapolis last year (141 times). 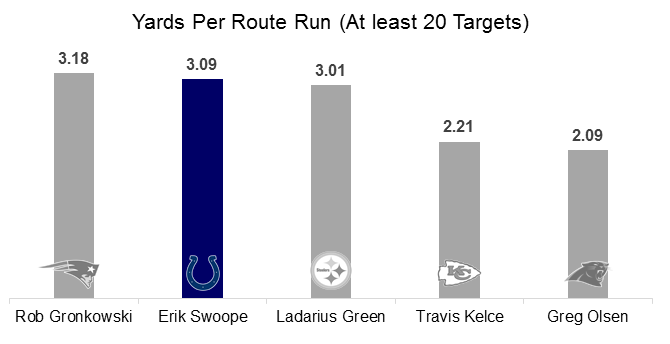 Swoope was second in the league last year in yards per route run among tight ends with at least 20 targets (3.09), behind only Rob Gronkowski (3.18).